London: Southampton’s dismal season hit a new low as the Premier League strugglers were dumped out of the FA Cup by second tier Derby after a penalty shoot-out on Wednesday. In a third round replay heavily influenced by the latest controversy over the use of VAR, Ralph Hasenhuttl’s side blew a two-goal lead in the closing stages at St Mary’s. The tie finished 2-2 after extra-time, with Derby winning 5-3 on penalties. Having avoided falling behind when VAR dubiously ruled out a goal from Derby’s Craig Bryson in the first half, Saints went ahead through Stuart Armstrong’s 68th minute header. Nathan Redmond doubled their lead with a cool finish two minutes later. Both Southampton goals were also referred to VAR, but the drama with the video assistant wasn’t over. Derby got one back with 14 minutes left when Harry Wilson’s free-kick went straight in and was allowed to stand by VAR despite Southampton’s claims that several Rams players were offside. Just six minutes later, Martyn Waghorn headed Derby’s equaliser from Wilson’s superb cross to force extra-time. Just as they had in the original match at Pride Park, Derby had battled back from 2-0 down. And Frank Lampard’s Championship promotion chasers, who knocked Manchester United out of the League Cup earlier this season, claimed another top-flight scalp in the shoot-out. Redmond was the only player to miss on either team, firing wide before Derby captain Richard Keogh netted the winning kick. The VAR decisions will stoke fresh debate about whether VAR is being used correctly after Chelsea manager Maurizio Sarri said officials don’t know how to work the system. Sarri criticised VAR following the controversial decision to award a penalty to Tottenham’s Harry Kane in Chelsea’s 1-0 League Cup semi-final first leg defeat last week. The Italian claiming he had seen a different camera angle that showed Kane was offside in the build-up to the penalty. 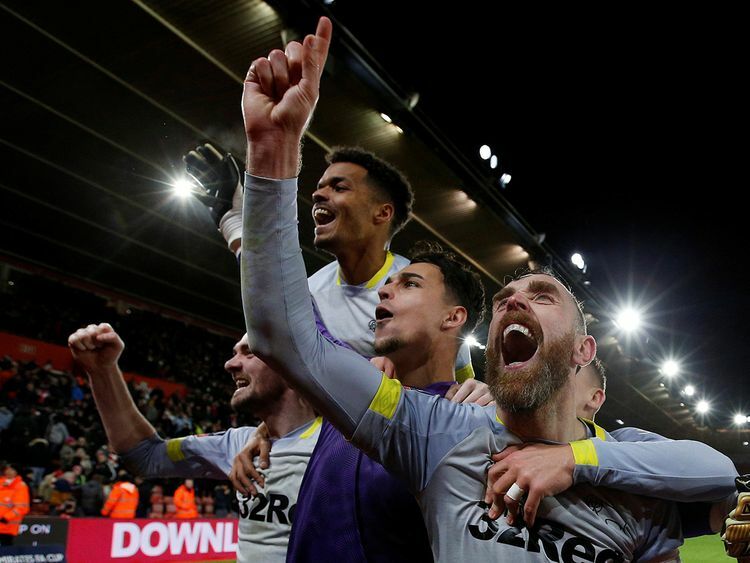 Derby County's Richard Keogh celebrates winning the penalty shootout with team matesDerby will face third tier minnows Accrington in the fourth round, while Southampton, one point above the bottom three, will have to face their tense battle to avoid relegation with no FA Cup incentives.